Instead of fretting about the 10 teens that will be ravaging the house tonight, I've decided to daydream about next year's garden. There is a whole new 8 foot wide "row" between the back fence and the trees. We are thinking it would be a good place for some plants. The patch to the right of the yard will be a corn field, and to the left, other veggies, like beans, peas, tomatoes, maybe beets, and who knows what all? Early in the spring, I'll go find some elderberry babies. This year, I will NOT plant them in the path of the watering hose. They would make a nice little hedge against part of the split rail fence, and there need to be enough for the birds and the family. I will finish putting in the other half of the row of lavender. I will distill the roses when they are in bloom. We will make rose hip jelly. The bayberries need to find a good spot in the woods. The marshmallow is too close to the door, and spreads out into the walkway. The flower bed in the front of the house needs a lot of work. This year, I won't let it get away from me. Okay. That's enough. Maybe it would be easier to think about dancing teens. It just dawned on me that the 8 days prior to the next deadline (Mar/Apr issue, deadline Jan 15), I will be almost completely incommunicado - working 12 hour days at a fair. That will leave very little time to respond to any email questions about the deadline and upcoming issue. This should be interesting! I will send reminders out to everyone who would normally get one, but with the New Year holiday, they could fall amid piles of unread emails. I'm kind of curious to see how it all pans out. I think it will be fine. We'll let you know :-). Taking a break in the hustle and bustle of cooking and wrapping and last minute primping to write about our wonderful tree. This is a Concolor Fir. It has a fragrance that is a blend of balsam and citrus. Very fresh! The soft 1" needles are green on top and blue on the bottom. It is a gorgeous tree. After the tree farm closed for the season, Molly and I went looking for a tree. They are all so pretty, so we decided to choose one that was all alone - meaning that it would have to be cut down anyway to make way for new planting or some other enterprise. We found this one. In the field, it appeared to be "typical" in height - around 7 feet. HAH! Bob cut off about a foot from the bottom, and you can see that it is still scraping the ceiling. 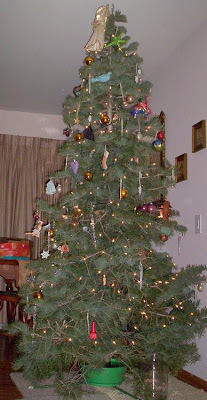 The angel is fastened onto the front of the top bough because she would have been mashed into the tree, otherwise. Now it didn't dawn on me until yesterday that the size of the tree makes a big difference in what is needed to decorate it. For the last 15-20 years, our trees have been smallish. 5' is plenty for me, but Molly wanted something bigger this year. We are only half done in this picture. Our smallish, handmade decorations are dwarfed by this tree! They disappear into the branches, and the tree - although heavily festooned - is in desperate need of some glitz. We went into the basement and found some of Mom's old decorations. She was the queen of gaudy when it came to the holidays. We added them this morning, and it helped.... some. Tonight the table beside the tree will be covered with the buffet that we will share. I'm sneaking some chickweed pesto into the mix, but won't tell them until AFTER they eat it. I know they'll like it. We'll talk and laugh about things that are happening in our lives now, things that happened in the past, and at some point I'm sure we'll talk about how much we miss Mom. We always do. It seems, though, that the older we get, the more laughter there is. I'm thankful for that. I'm an equal opportunity celebrater. It doesn't matter WHOSE holiday it is, I'm always game to celebrate. So on that note, I'd like to wish everyone a very happy holiday season, and a very happy and prosperous new year. It's taken me longer than usual to get the preview up for this issue. All I can say about it is that I am stunned with the quality AND the quantity of material that came in for this issue. The Essential Herbal has happily embarked on our 6th year, and if this issue is any indication, hang on to your hats!!! We really strive to stay within 32 pages. There are a lot of reasons, one of the more important being to stay under a certain weight for mailing. Another reason is profit - more pages = more printing = higher cost. But we squeezed and shifted, made the margins smaller, edited, and still we wound up with 40 pages. Sure, we could have saved it for the next issue or the one after that, but it's so GOOD! One of these days I will grow a business head. We missed regular contributors Susan Evans and Susanna Reppert, but they'll be back for the next issue! Today was the final day of the shop, and the tree farm closed for the season too. We did pretty well, considering that all we really do is take the stuff we are normally doing anyway, and putting it out for the folks shopping for trees to look at and pick up if they're interested. No advertising, no big deal, it's just for fun - so we were pretty pleased. The trees did very well this year too. People seemed to really want real trees. We had a great time playing with the gourds (yes, I've mentioned that before), and there are a few birdhouses hanging on the tree. In the front is a hinged gourd "box" I did, with all the edges trimmed in leather. I'm glad it didn't sell since it is my favorite. The shelves are looking pretty sparse in this picture. The weather was gorgeous all season long. There were only a couple of days that could even really be considered cold. Most days were just sweatshirt weather. So the shop closed at dark, and then, since today was Maryanne's birthday and tomorrow is Mark's birthday, everyone came up to my place for some soup and cake. It was nice and comfortable. I'd had company for the weekend, so everything was low-key. Altogether a very pleasant ending for a very pleasant season. Now we begin our holiday in earnest around here. Some shopping has been done in the odd moments we squirreled away here or there, but for the most part it is yet to be done. Molly wants to do some baking, and we need to get a tree (I know a place...). The magazines are all packed up to go to the shops and writers - bulk mail went out last week - but I think they'll wait until Tuesday because tomorrow is supposed to be a nightmare at the post office. Yep - now the holiday begins! I've been whining for a couple of weeks about all the soap we've been making, so last night I snapped a couple shots of the stacks in the racks. We're just about ready to move on to bathing herbs and sniffing jars. Today will be the busiest day of the year on the tree farm. The soap curing room makes the shop smell wonderful, and I have mixed feelings about that. It also makes people buy the soaps - and it keeps flying out the door while we keep trying to get the shelves full. I know... some big problem, eh? These are just some of the soaps. Because of the layout of the shelving, it wasn't possible to get all of them. There are about 19 different varieties. A couple of them are seasonal, so we aren't worrying too much about them right now. I'm not talking about that nasty breach of etiquette that came along with the advent of the Web. You know, where people just say whatever comes to mind, with no thought to the consequences of their words? As time and experience with the social nuances of virtual conversation have gone on, most people have learned to be civil. Thank goodness. That was an ugly little blip in time, wasn't it? No... what I'm talking about is those times when the computer just doesn't do what you expect it to do. Last night I spent 4 hours (and if you've read the last few entries, you know how precious those hours are) trying to get a program that I've been using for years to work. I found a level of frustration that was here-to-fore unknown. The worst part is that I know this is my own doing. I can follow directions to a T, but if they don't work, I'm doomed to try again and again, pulling out the meager tricks that reside up my short sleeves. It wouldn't be so bad, except it is the program that sorts addresses to get the magazines out. The magazines are here all ready to be sent out, but the mail program freezes the computer when I do anything more than gaze forlornly at the icon. Tech help will contact me soon, and I will have to sound like a blazing idiot to someone who speaks computerese. I speak thing-a-ma-bob. At some point, this will be fixed. Within a matter of minutes (ok...this might take a little more time than usual because I'm highly peeved) blood pressure will drop back to normal levels, my computer will return to its typical "friendly" mode, and I will all but forget how much I'd like to take a sledge hammer to it. At least that's what I keep telling myself. Yes... all will be calm. The address labels will be printed and the magazines will be sacked and delivered to the post office, where my favorite postal workers (in Landisville, they are GREAT!) will crack me up with a joke. Soon the magazines will be arriving in shops, and into the hands of subscribers - who will LOVE this issue. Yes... yes... I can see it. Most mornings of late look a lot like this - my back yard. It seems to have permeated my brain as well. I've barely had a moment to sit down and write about all the stuff that's going on. The first development was being invited to participate in the PA Farm Show. That might not ring a bell for many people outside of PA, but it is huge here. It involves 8 days, 12 hours each, and 400,000 attendees. Lancaster County Soapworks - my sister's company - is the official stand holder, but The Essential Herbal will be there under her wing. We will be doing two stage demos. This event takes place in the early part of January, beginning on the 6th. It is in Harrisburg. We will be in the Family Living section, which includes spinners, woodcarvers, weavers, chair caners... stuff like that. I'm certain that it will be great fun, and I'm equally certain that those long days will surely put the Crocs to the test. But then, Frog Hollow Evergreens is seeing a record setting year! They have a "one price for any tree" deal, and folks really appreciate how reasonable it is. There aren't any hidden charges. Word has spread, and it is busy. Our little shop is seeing some of the best action we've gotten in years - including the renewal of a wholesale account that had gone missing. Even the hydrosols that were put up on a whim are selling! Maryanne is trying to squeeze in some custom requests for her torchwork. We are having some big FUN!!! The magazine will be done at the printer's on Thursday. I'll get it into the mail (hopefully!) on Friday so that when Saturday rolls around I can be down at the shop. Sooner or later, there will be some shopping to do and some decorations to toss out there. I'm hanging on with both hands and grinning from ear to ear.